Pretty things abound. Here are some things I’ve seen this week that I think you’ll enjoy. I am the pickiest when it comes to coffee mugs. I prefer tall slender mugs to big bowlish mugs—the coffee gets cold quickly, too much surface space. And I like the way a skinny mug feels in my hands. This one meets my criteria. This mind-over-matter plant container makes me smile. If I had to live in a barn I’d choose this Michigan barn. Speaking of barns… West Elm has the sweetest Love Thy Farmer tote bag. And, I do love my farmers. I’m into kale. I want to Jodi’s recipe for crisp kale and brussels sprout tacos with avocado and white bean creama. Everything is good when it’s in a tortilla, right? Photo from What’s Cooking Good Looking? 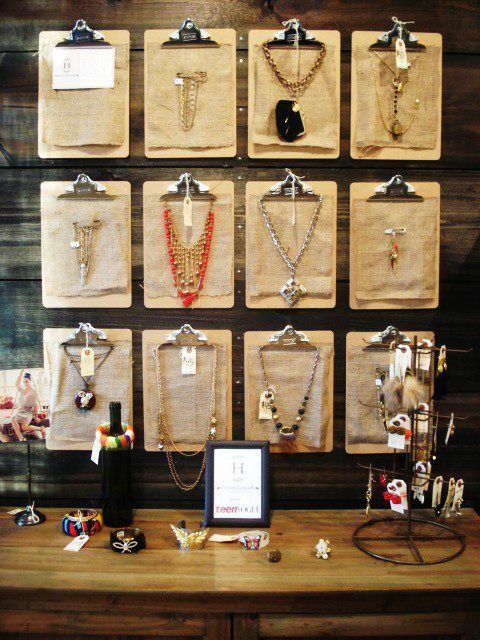 If you’ve got a bare wall in your closet and a few clipboards here’s a fun idea for your chunkier necklaces. No matter how smiley the dustpan, I will likely never feel happy about sweeping. Finally, my favorite wallpaper in removable tiles. For those of us who like to change with the weather. your favorites are always my favorites too…..